Are you curious about blogger modification and enhancement at hard level? If yes then most probable reason should be to improve SEO score. There are so many methods and philosophy available over the internet, but out of them it's hard to find which one will actual affects our blog. For blogger user first you need to improve basic title of individual post. By default blogger will include your blog name to all individual posts. That will cause some problem on over all rank of your site. And other most important thing to improve is giving H1 tag to post title, and normal/no tag to your blog title. By default blog name is assigned as H1 and post title as H2. Generally Home pages have recent updated posts list. That will notify users about new updated contents. But all those links are by default H1, Thus it will affect on seo because as per google webmaster guide lines A webpage should not contain multiple or repeated html tags. It will cause negative impact on search engines, This will not make any cause on website reputation, Because users can not see that at all! Sub title in post :H2, H3, as so on. Now check and verify your blog if it has proper structured tags or not. For individual post we do not need to change anything. Following guide will only helps you to improve home page links so it does not cause any critical problem to web crawlers. Now do following steps to assign H1 HTML tag to Post title for individual post and H3 for Home page links. If you already improved basic HTML for seo as told above then now its time to proceed further. first let me clear about actual idea. Assign conditional Html tags to optimize it. It is highly advised that before do anything first back up your current template. Now put conditional statement between home page and individual post. Now your code should look like this. Now verify it for successful results. You can easily do it with google chrome. Just open your website and right click on post title links and click on "Inspect element". 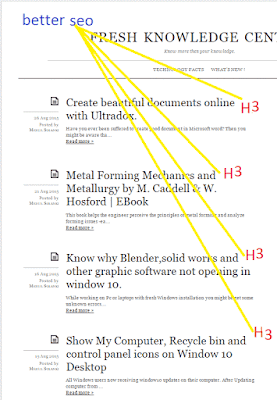 Then verify it if H3 tags is sucessfully assigned on home page for all post title links and H1 for individual post. Sometimes, human think so wrong and did the wrong action. In another word, the writer gives the information about superior paper with the worst side of the human nature. This side of the human being is so dangerous and when they fell, they did not believe this reality. Thank you for this information. I will try and see this in my blog.